Malaysian Society of Anaesthesiologists - Thank you for visiting and welcome to our new website! Thank you for visiting and welcome to our new website! 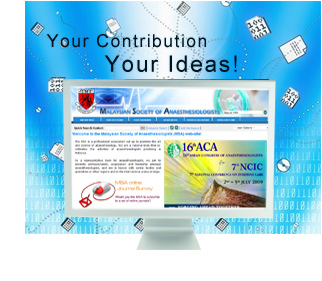 Welcome to the Malaysian Society of Anaesthesiologists’ website. The Malaysian Society of Anaesthesiologists celebrates its 50th anniversary this year. The Society held its first inaugural meeting in Ipoh, Perak on 5th October 1963. We have since moved forward in leaps and bounds. Currently the Society has total members of 752. The Society inspires and promotes continuing medical education and research, protects the welfare and interests of anaesthesiologists and the specialty in the country, whilst ensuring high quality patient care and safety. The Executive Committee aims to provide a wide array of CME activities in anaesthesia, critical care and pain medicine by organising workshops and conferences. We encourage collaboration of educational events, both at the local and international level. The number of online journals available has increased for the members. Please do enjoy the reading while keeping updated with your clinical practice. I look forward to receiving more research applications for funding. I am always open to new ideas, so feel free to drop me a line.